Escape from Obesity: Farmer's Market: Duck Eggs! It's spring, and while my local Farmer's Market still doesn't have new fresh spring produce available yet, they do have things I regularly buy, like grass fed beef, local pastured milk, local raw honey, and free range chicken eggs. On this week's shopping trip there was something I have never tried: fresh local duck eggs. So I decided to bring some home and see how they taste! 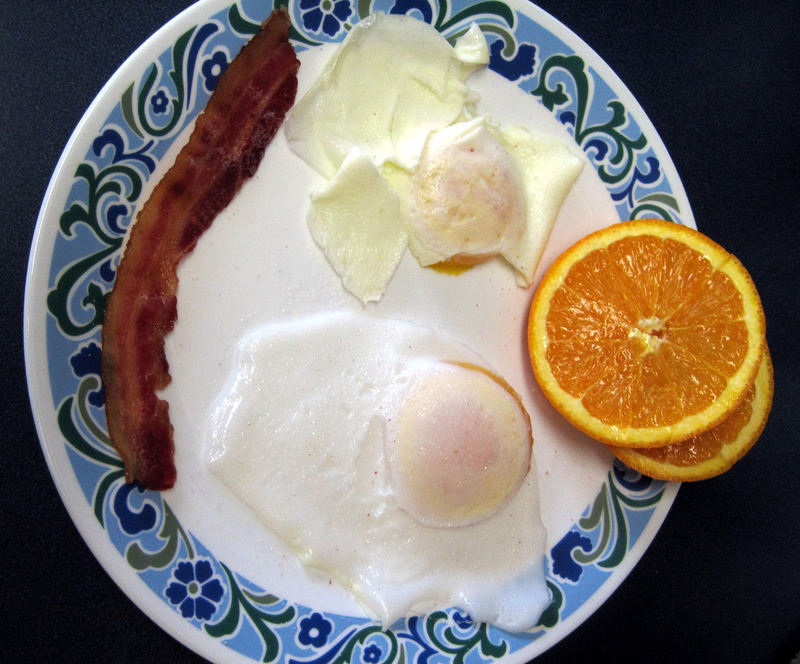 Check out those gorgeous orange-yellow yolks! Eggs from free range birds are naturally richer in all kinds of vitamins and minerals and omega-3's because of the varied, natural diet of the birds who feed on grasses, seeds and bugs. That's why free range eggs are better for you; it is also a much happier life for the chickens and ducks who get to wander around and be birds, rather than being literally cooped up in cages or boxes in crowded, unsanitary factory "farms". Anyway, from what I am told, duck eggs have a higher fat content in the yolk and a higher protein content in the white than chicken eggs. Because duck eggs are larger, they have more calories (180 compared to about 70-80 for a chicken egg) but when you go by weight, the calories are about the same. Here's a comprehensive nutritional comparison between the two. What stands out most to me is that duck eggs have more than double the iron content and more than FIVE TIMES the B-12 as chicken eggs, per 100 grams. That is significant! 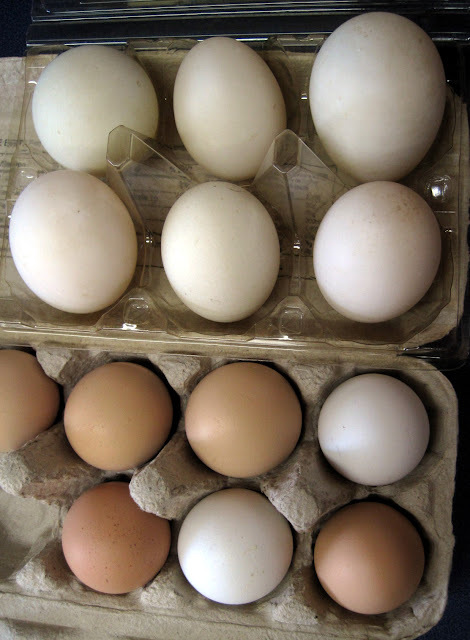 They also have more of almost all the vitamins and minerals contained in eggs. Unfortunately they also have more than double the cholesterol. I found the duck egg to taste very similar to the chicken egg. The yolk was *much* creamier/thicker than the chicken egg's. In fact it was so thick it was kind of a turn-off to me. 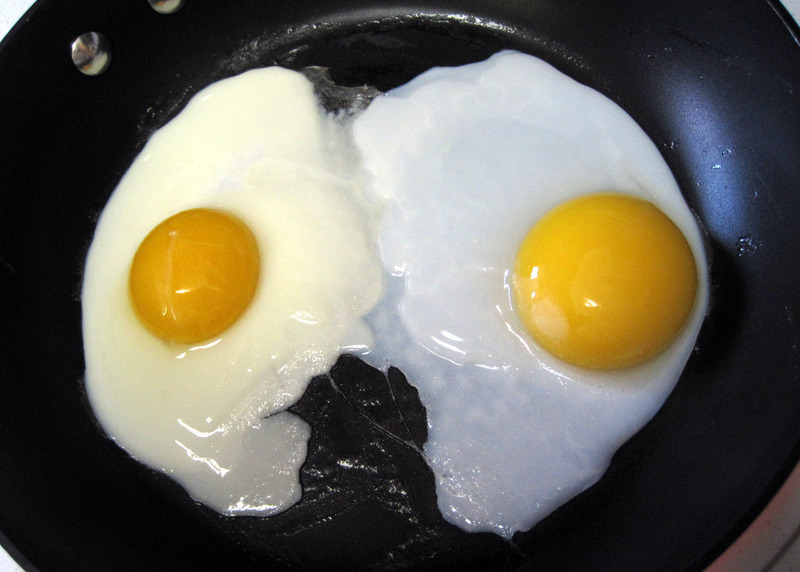 I guess I am just used to runny yolks. I gave about half the duck egg to my dog. She gives it two paws up. I think the somewhat richer texture and flavor of the duck egg would be excellent scrambled or made into a custard. I will try that next. Six large duck eggs cost about the same as 12 medium chicken eggs (both types are local and free range) so I will stick with buying chicken eggs in the future unless I am making something special that I want the richer duck eggs for. I do think the extra B-12 is a really good thing though, so if they go on sale I will buy more of them. Get out there and try new, healthy things! It is fun to explore what you can find locally. Coming up soon: how I made healthier yogurt out of fresh local milk from pastured cows. I made it in my crock pot last night and it is almost ready to eat. And now I am going to ride my bike! Hey Lyn! Another one of those documentaries just came out this week - it's www.hungryforchange.tv and you can watch it online for free until March 31. It's POWERFUL. our family is on the road to excellent health, and this just confirms the direction we're going. I hope you find it as hopeful and life-bringing as I did!! Omg, I can't wait to hear about the yogurt! I want to make yogurt that ferments ALL the milk sugar away, because when I try eating yogurt, even higher protein Greek Yogurt, I always gain weight, and I miss it! The duck eggs thing is so interesting! Duck meat is higher in fat also. Guess it makes sense, since they need to stay warm in water! I would love to try them. How did they compare in cost to free range chicken eggs? I recently did some research and started paying $8 a dozen (!) for pasture raised eggs because I want to support that and they are SO much better for you, but it's hard, financially. Chicken eggs, duck eggs, whatever the subject, it is so delightful to see signs of the "you" that started this blog and reveled in her success and joy of eating this way for a couple of years and loving the outdoors and the pleasure of...life! May this be the start to your way back to health, vigor and serenity. I can NOT wait for farmer's market season!! I am *very* lucky to live where I can get a lot of locally farmed stuff reasonably priced. The free range chicken eggs, medium, are $3/dozen and the duck eggs were $3.50/6. I buy a dozen chicken eggs a week, but I still buy "cheap" grocery store eggs for my teenage boys who will sit and eat 6 scrambled eggs in a sitting! Thanks for being adventuresome and sharing with us. I've never had a duck egg, but just might try one now. I've tried several things because of you. In fact, my husband planted brussel sprouts this year because I asked him too after reading your post ages ago about them. I cannot wait to read about the yogurt. I feel like these last two posts are more positive and taking you on a good path. Great job! i hardly eat eggs just cant do it unless they're disguised in gravy or drowned in cheese which defeats the purpose! lolol sounds like you have a great farmers market. we have a "sale" two days a week where the amish have baked goods, meats, cheeses etc that thye make. and lemme tell ya the amish know good eats! Great to hear you sounding back to positive, Lyn. Have a great weekend. Oh my gosh, duck eggs are amazing! But my all time favorite is goose egg!!! Turkey eggs aren't that good. Oh boy, just thinking about goose eggs makes my mouth water!